Each year, PNNL celebrates excellence with the Laboratory Director's Science and Engineering Achievement Awards. A number of individual awards and one team award recognize PNNL researchers for significant contributions in their respective fields. The 2017 Award for Exceptional Team Achievement in Science & Technology went to PNNL's VOLTTRON™ team. 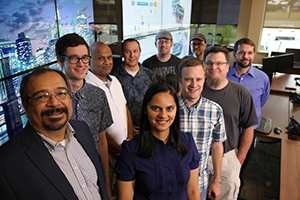 The VOLTTRON™ team is recognized for creating a software platform for distributed control and sensing and successfully transitioning this platform to multiple vendors to implement energy efficiency, diagnostics, and transactive energy methods. VOLTTRON™ is open source and publicly available from GitHub, and ongoing development benefits from a highly-collaborative approach. The U.S. Department of Energy provides funding support and views the technology as a central component of buildings-grid integration, creating an environment where data and devices connect seamlessly and securely to make decisions based on user needs and preferences. Platform updates and other advances are carried out by the PNNL research team, working in concert with an active nationwide community of users. VOLTTRON™ team members are: Bora Akyol, Craig Allwardt, Zach Beech, Brandon Carpenter, Joseph Chapman, Wendy Cowley, Jereme Haack, George Hernandez, Tim Kang, Srinivas Katipamula, Robert Lutes, Kyle Monson, Shwetha Niddodi, Michael Roup, Poorva Sharma, and Chandrika Sivaramakrishnan. The Director's Science and Engineering Achievement Awards honorees will be recognized during PNNL's Pathway to Excellence Award Banquet in September 2017. Learn more about this innovative software platform at volttron.org.